Protection of environment. Commemorative coin "Lynx"
within the circular geometric ornament – the relief of the State Coat of Arms of the Republic of Belarus; beneath – year of issue, alloy standard; inscriptions along the rim – at the top: "РЭСПУБЛIКА БЕЛАРУСЬ" (REPUBLIC OF BELARUS), beneath: face value "ПЯЦЬДЗЕСЯТ РУБЛЁЎ" (FIFTY ROUBLES) – on gold coin and "20 РУБЛЁЎ" (20 ROUBLES) – on silver coin coin. 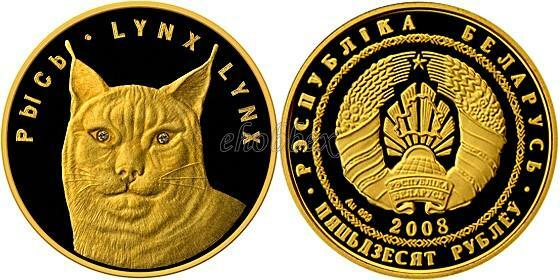 in the centre – the relief effigy of lynx's head, there are insets of diamond in eyes on the gold coin and 2 yellow colored crystal of Svarovsky; inscriptions along the rim at the top: РЫСЬ LYNX LYNX.